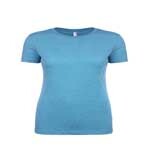 - Anvil® Women's 4.2 Ounce Tri-Blend T-Shirt. - 4.2 ounce 50/25/25 polyester/combed ring spun cotton/rayon. - Semi-fitted contoured silhouette with side seam. - Double-needle sleeves and curved bottom hem. Anvil® Women's 4.2 Ounce Tri-Blend T-Shirt. 4.2 ounce 50/25/25 polyester/combed ring spun cotton/rayon. Semi-fitted contoured silhouette with side seam. Double-needle sleeves and curved bottom hem. Taped shoulder-to-shoulder. TearAway label. Oeko-Tex® Standard 100 Certified. Sizes S-2XL: Neutral: White. Colors: Black, Heather Aubergine, Heather Blue, Heather Caribbean Blue, Heather Dark Green, Heather Dark Grey, Heather Galapagos Blue, Heather Green, Heather Grey, Heather Purple, Heather Red, Heather Raspberry.